This may explain why I haven’t been updating my blog and I honestly feel terrible for it. But since week 4 I was so sick I could just about get up in the morning to go to work and as soon I was home I would go to sleep! We are both super excited to become parents and all the changes we’re making to get there, so bare with me! Since finding out on the 11th June my health and my unborn baby have been my main priority. My husband and I have been trying for a baby for a little while we went through some fertility problems but we managed to do it all naturally the moment we both gave up trying! I always knew I wanted a beginning of the year baby (January or February) so I guess someone up there knew my wishes! I started feeling sick around my husband’s birthday and thought it was a bug I had caught from our nephew this carried on for 4 days, I kept having dreams I was pregnant so one morning at 5am I decided to take a test! The moment we found out we were expecting so many emotions came through, worried I wouldn’t make it to 12 weeks, scared, happy, everything. I will never forget the look on my husband’s face the moment I showed him the test. As far as symptoms I have had every single one in the book, I haven’t had it easy at all. The morning sickness was the worst the first couple of weeks I couldn’t keep anything down. I then went off meat completely and was only eating potatoes or rice! 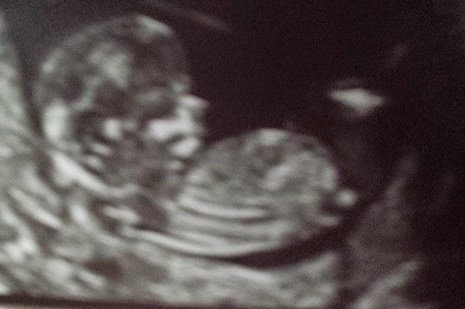 At week 9 I had an emergency scan as I was having such bad cramps I was picturing the worse when me and my husband saw a VERY active bundle of joy. These went on to stop a couple of days later thank goodness! Now that I’m coming to an end in week 12 the sickness is slowly starting to go and being replaced with headaches and exhaustion! I can’t wait to start feeling like myself again.. Stretch marks? A few, I’ve been soaking myself in bio oil if you’re meant to get them you will. Sleep: My dreams are crazy, they keep me awake. Best moment this week: My birthday, baby gave me a day off from sickness. Miss anything? Hmm, runny eggs! Anything making you queasy or sick: Tuna! Food cravings: Hmm, I’d say anything sweet but I have craved figs like crazy! Gender: We both think we’re having a girl, but happy with a boy. Whatever comes will be more than welcome! Guess we will see at 20 week scan. Symptoms: Vivid Dreams, Morning Sickness and Headaches. Looking forward to: Feeling baby move! I will be updating along these next months. I will start to upload beauty related blog posts soon I promise! You're expecting an addition to your family. A baby brings you more love than you ever thought humanly possible. This is indeed a very special gift that will absolutely change your life forever - for the better! I hope you can continue all your beauty/style posts during your pregnancy and as a new mom! Hoping you have a healthy pregnancy! With love congratulations and Best Wishes.